〈人が〉〔…を〕頼る 〔on，upon〕《★受身可; ★【類語】 depend は他の人・物の力や援助を求めて頼るの意で，しばしば自分自身に力や考えが不足していることを暗示する; rely は過去の経験や客観的な判断に基づいて頼る》. Children depend on their parents. 子供は親を頼りにする. I have no one but you to depend on. 私にはあなたしか頼れる人がいない. The Japanese depend on fish for half of their animal protein. 日本人は動物性たんぱく質の半分を魚に依存している. You can depend on her word. 彼女の言葉は信頼できるよ. His statement cannot be depended upon. 彼の陳述は信用できない. You may depend upon his consenting. 彼は大丈夫同意してくれるだろう[彼が同意してくれることは間違いない]. You can depend on her to do it right. 彼女なら心配いりません, 必ずそれをきちんとやります. You may depend on it that she will go with you. 彼女は大丈夫君と同行してくれるよ. Our success depends [will depend] entirely upon the weather [everyone working hard]. 我々が成功するかどうかは一に天候[各人の懸命の働き]にかかっている. 〔(+前置詞)+wh.節〕〈事が〉〔…かに〕かかっている 〔on，upon〕《★進行形なし; ★【用法】 《口語》 では on，upon が省略されることが多い》. Everything depends on whether you pass the examination. すべては君が試験に通るかどうかにかかっている. It all depends (on) how you handle it. それは君の扱いかた次第だ. depénd on [upòn] it Thàt [It] (áll) depénds. Our success depends on our effort. That depends completely on the circumstances. Everything depends on his mood. Whether or not I apply for the job depends on how much the salary is. “Can you give me a ride? "“It depends where you are going." “We might see a movie tonight, right? "“It all depends what time I get home from work." You may depend on our cooperation. He is the sort of person we can depend on in an emergency. You can depend on his coming on time; he is always punctual. Most Japanese college students depend on their parents for their livelihood. Japan depends on other countries for wheat. Two lanterns depended from the ceiling. The matter is still depending. It takes about 30 minutes to go there by car, depending on the traffic. Depend on it, she'll show up. 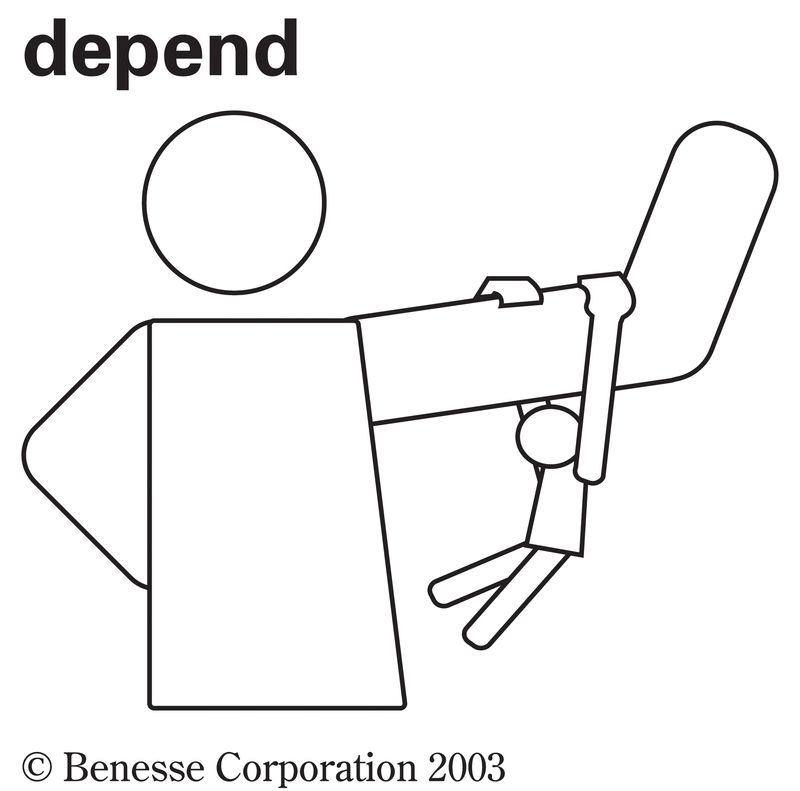 成句It (all) depends.⇔That (all) depends. “Could I ask a favor of you? "“It depends." "Can you give me a ride?" "It depends where you are going." "We might see a movie tonight, right?" "It all depends what time I get home from work." "You won't tell anybody, will you?" "You can rely on me." You can depend on her. We can't rely on the weather here. Can I count on you if we need help? "Could I ask a favor of you?" "It (all) depends." I don't know if we can help-it all depends. Borrowed from Middle French dependre, from de- + pendre (“to hang”), or from Latin dependeō. (intransitive, followed by on または upon, formerly also by of) To be contingent or conditioned; to have something as a necessary condition; to hinge on. We would like to go skiing, but it depends on the amount of snow. (intransitive, followed by on または upon) To trust; to have confidence; to rely. we depend on the mailman to come at the usual time. The long rows of teeth on the bulwarks glistened in the moonlight; and like the white ivory tusks of some huge elephant, vast curving icicles depended from the bows. Besides, if you worked up to be a cadet officer, you got to wear a Sam Browne belt, from which depended a nifty saber. (archaic) To be pending; to be undetermined or undecided. In perjury, the capias, warrant, and affidavit, are good evidence that a cause was depending. "A Letter of the King sent to his Proctors at Rome, concerning a Case of his in the said Court depending." depend in The Century Dictionary, New York, N.Y.: The Century Co., 1911.